Having a Google Scholar profile is a good idea if you are a researcher; A list with all your publications is then likely to rank high in the search results if people are looking for you online. How do you make the most of Google Scholar when you also have a WordPress website (with the DIVI theme)? If you do not have a Google Scholar profile yet and would like some more information on why to create a profile, how to do it and how Google Scholar deals with citations, I recommend the guide to Google Scholar from the library of the University of Reading. A tip that they give is that “once you have set up the profile, you can choose automatic updates so you don’t need to spend a lot of time updating your publications list.” Your academic publications are already listed on lots of websites: university repositories, journal websites, JSTOR, EBSCO, ProjectMUSE, Mendeley, ResearchGate, Academia… Google’s crawl bots will find them there and add them to your profile. If you would like to see what such a profile looks like: here is my own Google Scholar profile (in a previous life I was a researcher myself). Once you have a Google Scholar profile, why not make use of that on your WordPress / DIVI website? One of my clients for example chose to put just a few publications that he wanted to highlight on his personal website, and to link to his Google Scholar profile for the full list. Now I don’t think that this is necessarily the best strategy for everybody; Having enough good-quality content on your site and regularly adding fresh new content is important for SEO or Search Engine Optimization (in order to get your WordPress website to rank high in Google’s search results). But this particular client regularly has other content to add, such as all his speaking engagements. 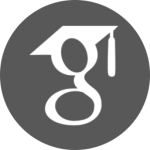 What is, however, a good idea for everybody is adding the Google Scholar icon to your WordPress website as one of your social media icons. If you are making your website using the DIVI Theme by Elegant Themes (that I myself use on all the sites that I create), you will notice that this icon is not included in the standard options to add social media icons (not surprising, of course, as it is very much a niche platform). However, with the DIVI Booster plugin ($19) you can add many more social media icons to the top nav bar, including Google Scholar and ResearchGate (you can see how this looks at the top of this site). B.J. Keeton last year published a blog post with Elegant Themes (the creator of the DIVI theme) on “How to Get Indexed by Google Scholar Using WordPress.” In my experience Google Scholar will usually find your publications without problems. I have personally at least never heard from clients and former colleagues that they had problems with their publications not showing up. These publications are already listed on all those sites I mentioned at the start of this blog, which are most likely all optimized for Google’s crawl bots. So whether your publications get indexed will therefore not depend that much on the particulars of your personal WordPress website. List your publications on a page that is called ‘Publications’.